At five-years old, and incredibly easy to care for, this lush specimen makes a memorable gift for men and women who enjoy novelty and scarcity. 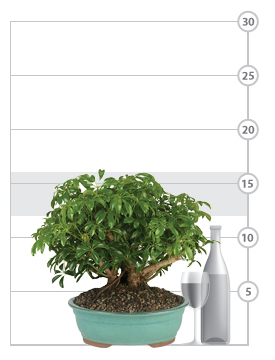 Thrives, even in low light and is cultivated for indoor and outdoor enjoyment (depending on climate and season). We ship this exceptional gift in a Yamato green Japanese-style ceramic cachepot. 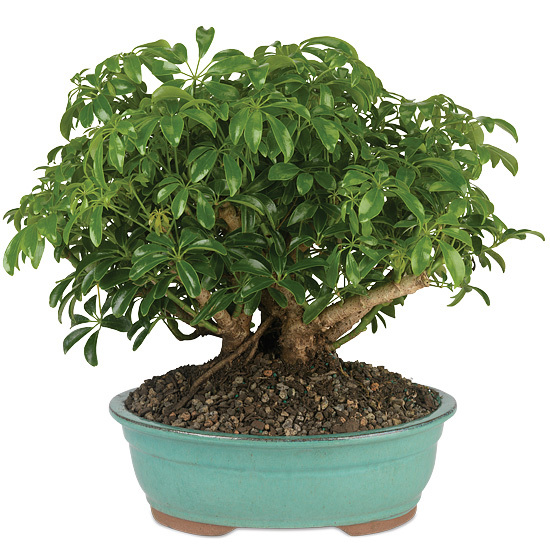 Your Hawaiian Umbrella Bonsai prefers direct or low light and does best in temperatures between 50-90 degrees Fahrenheit. The plant may be placed outdoors in warmer weather but should be brought indoors during the colder months and should never be allowed to freeze. Water thoroughly every other day. Feed with an all-purpose fertilizer when the plant is actively growing and repot every 3-4 years.